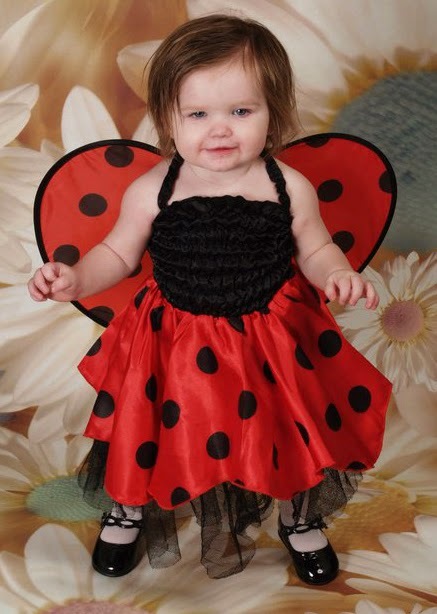 Admittedly, the photos are from a couple of years ago, but aren't my grandchildren absolutely adorable? 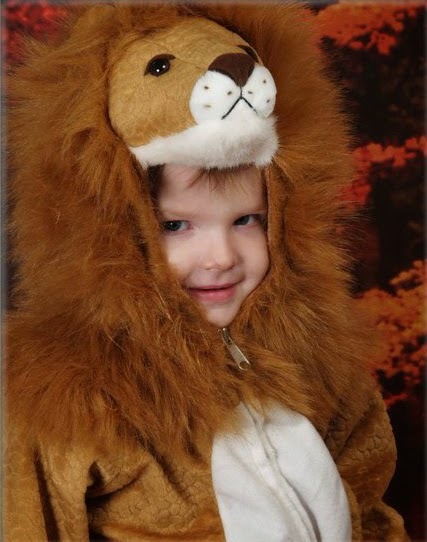 I remember getting dressed up for Hallowe'en, but my parents apparently never took photographs of my siblings and me in costume, because I've never seen any among the ones that I have. Happy Hallowe'en to everyone! I was so excited about starting to catch up on The Galitzianer schedule in July, but I was foiled on this issue by having to wait for some material I had no control over. It's currently at the printer and will be mailed soon. Ah, well, there's always the December issue. And at least I haven't fallen further behind! This issue of The G has interesting articles, as always. Among them, the "Research Corner" discusses several newly discovered records from different parts of Galicia. The "Preservationist's Corner" talks about ongoing efforts in Przemyśl to preserve and maintain what remains of Jewish heritage. 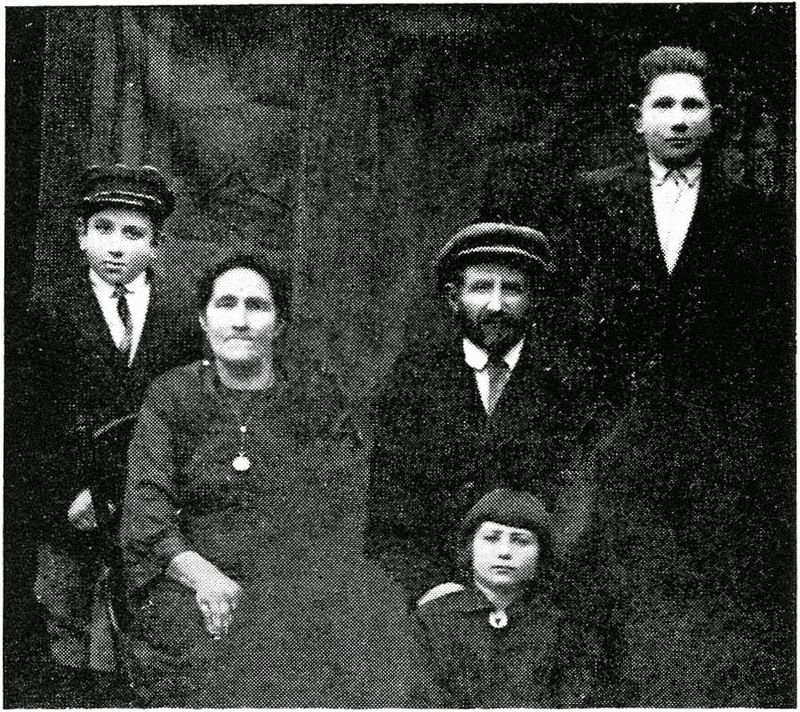 A doctoral student from Rzeszów University is searching for letters and other documents from Sanok that will help illustrate the community history of this shtetl. A list of 39 religious schools that were closed, including 18 schools in Skała, gives the names of the teachers of those classes. 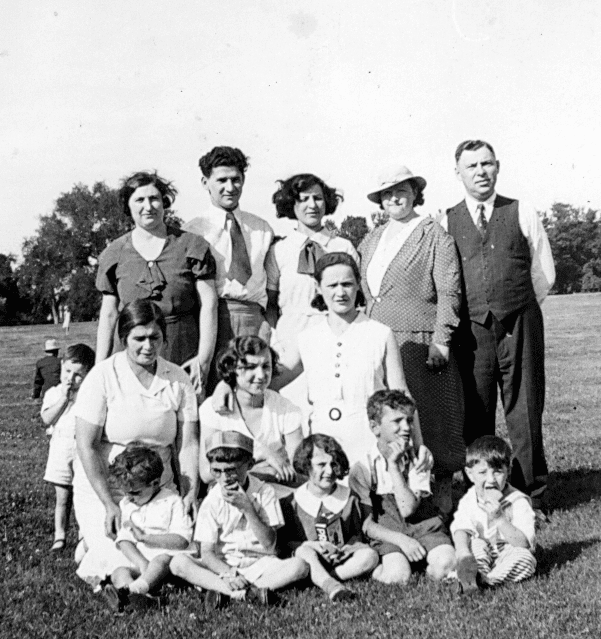 And a "Family Album" story includes documentation of a son who was left in Europe to recover from pinkeye while the rest of his family immigrated to the United States through Ellis Island; the young boy caught up to his family a few months later. Members of Gesher Galicia receive The Galitzianer as a benefit of membership. Gesher Galicia is a nonprofit organization focused on researching Jews and Jewish life in the former Austro-Hungarian province of Galicia. A list of member benefits is available online. Information on becoming a member can be found here. I accept submissions for The Galitzianer from both members and nonmembers, and I enjoy reading every one. Would you like to share research techniques you used to learn more about your relatives? 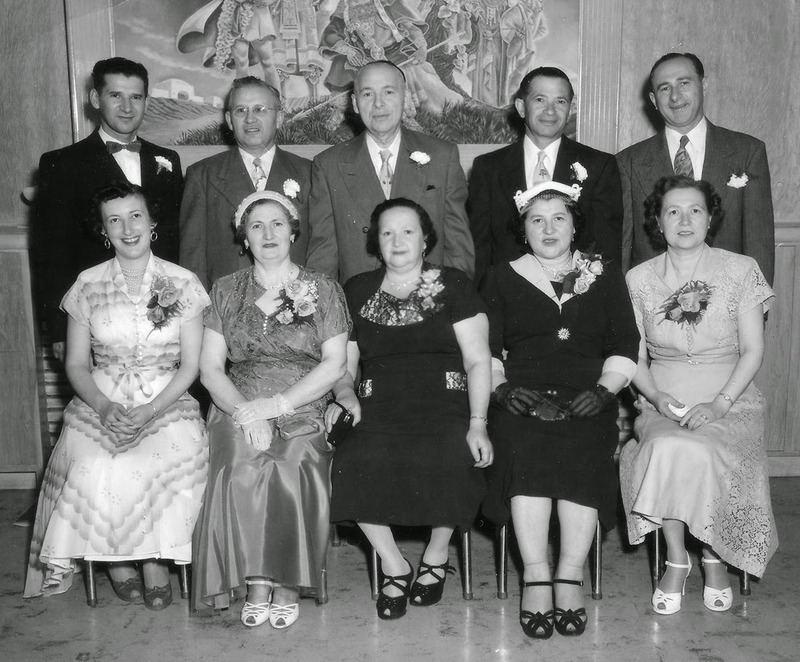 Have you been successful in obtaining Jewish community or notary records? Perhaps you traveled recently to your ancestral Galician shtetl and would like to write about your experience. Historical and recent pictures, lists, and book and movie reviews are also welcome. If your submission is published, you will receive a copy of the issue even if you are not a member. Submissions may be articles and/or graphics, both original and previously published, and must be relevant to Galician Jewish genealogical research: articles about recent trips to Galicia, reports on your own research, historical and recent pictures, etc. Electronic submissions are preferred, though not required. If you wish to submit material for consideration, please contact me at janicemsj@gmail.com. 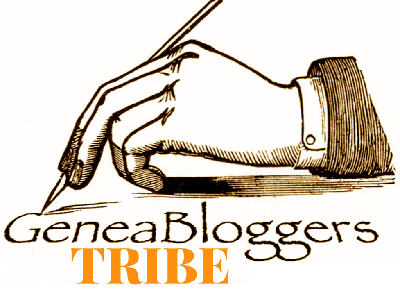 I accept submissions year-round, but the deadline for the December 2014 issue is November 20. I Found Two Possible Siblings of My Great-Great-Grandfather! One of the great advantages of searchable electronic databases is their ability to show you information you wouldn't have thought to look for. Even if you had considered looking, the time required might not have been practical. Many years ago, I rented several rolls of microfilm of Jewish metrical records from Kishinev, Russian Empire (now Chisinau, Moldova) from the Family History Library. 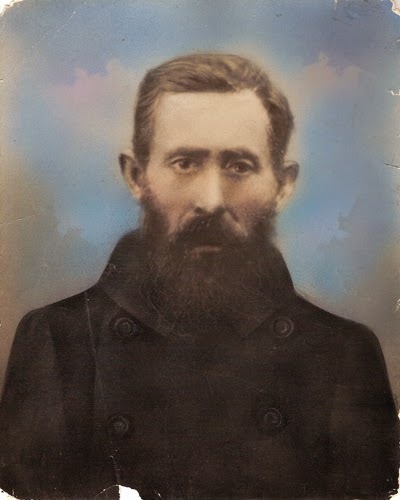 I was trying to find information about my great-grandfather's family, which I had been told moved to Kishinev from the Kamenets Podolsky area some time soon after his birth. My search was very successful. I found the birth registrations of five of the six younger children in the family, the death record for my great-great-grandmother, and the index entry for my great-great-grandfather's second marriage (the church did not have the full marriage record on film). I learned that this branch of my family was probably reasonably well educated, because when those five siblings immigrated to the United States the birthdates they used were surprisingly close to the actual dates. I also learned my great-great-grandmother died one month after the birth of her youngest child, and that my great-great-grandfather did not remarry until two and a half years later, even though he had a one-month-old child. I still have those microfilms on extended loan at my local Family History Center in Oakland, because I know it can be helpful to go through these types of records and look for other people with the same name and from the same place, as they might be related. As these records were in Russian handwriting from the 1890's to the early 1900's, however, I kept putting it off, because I didn't want to slog through the 100+-year-old Cyrillic. But now we have the Internet and searchable databases. Several volunteers have transcribed many of the FHL microfilms of Kishinev records, and the transcriptions are now online in one of those databases. I was recently doing research for someone else and ended up searching in the database that includes the Kishinev metrical records. I didn't find any relevant information for the family I was researching, but I really thought there should be something. To test the database, I searched for my family name, Gorodetsky, to see what kinds of results I would get. The first thing I did was look for the information I had already found on microfilm. All of it was there — that was a good start. In these records my great-great-grandfather was consistently listed as being from Orinin, and his father's name as Gersh Wolf. Then I glanced over the other results from the search. I noticed a minimal death listing with my great-great-grandfather's name as the father. I found another listing with more information about the same death and discovered that my great-great-grandmother had had at least one more pregnancy beyond the eight children I knew of, but this one apparently had sadly ended in a miscarriage. I didn't know that miscarriages could be included in the death registers, but at least this one was. Then I saw a second Gorodetsky whose father was also Gersh Wolf and who was from Orinin. This man was potentially a brother of my great-great-grandfather! He had three children listed in the database results. Based on the birthdates of his children, he was probably a little younger than my great-great-grandfather. I also found the death of a woman with the same father and from the same town, but she's quite a bit older than my great-great-grandfather. She might be a sister! It appears that she was not married. Looking at the range of ages for these possible siblings made me wonder about my third-great-grandfather. If these three were siblings, I wonder how many wives/mothers there were. It's plausible, though on the extreme end, that all three could be children of the same mother. Unfortunately, these records give only the father's name; the mother's name is not included. I also began to think about Gersh Wolf's possible age. I realized that none of Gersh Wolf's eight grandchildren I know about and the three potential grandchildren from the database had that name. It was a common practice among many Eastern European Jews at this time, including my family, to name children after deceased ancestors. 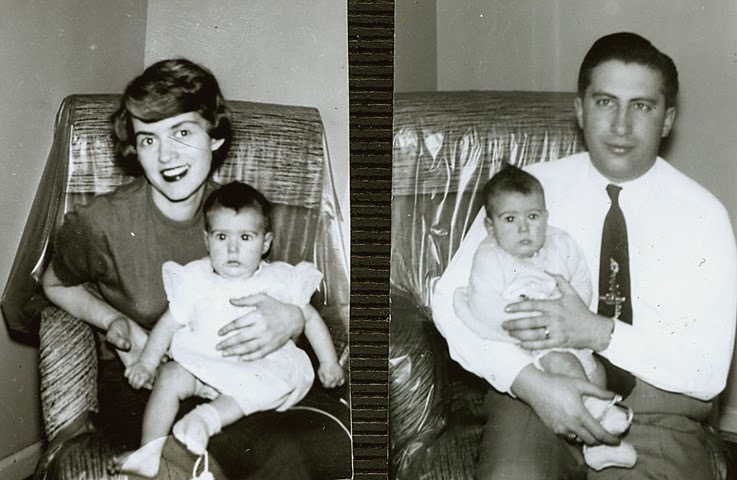 In fact, my great-grandfather and three of his siblings named their first daughters after their mother; three of the siblings named their first sons after their father. Admittedly, I know the names of only eleven possible grandchildren, but those births extend to 1910. I'm starting to consider whether my third-great-grandfather was still alive as of that year, and that's why no one had yet named a child after him. If Gersh Wolf was the father of the woman whose death I found, however, he had to have been born by around 1818 at the latest, so that would make him at least 92! Of course, it's also possible that his children didn't like him, and that's why they didn't name any sons after him . . . .
Obviously, I need to follow up on all of these potential new clues. And all this because I decided to poke around in a database! Talking to relatives about their lives is one of the best ways to learn more information, especially great stories, about your family. The Jewish Women's Archive is offering a free Webinar on how to lead an oral history project. It will be primarily geared to working with students, but the description also mentions working with your community, so I'm sure the techniques discussed will be useful for almost any genealogist. The Webinar will take place twice on Thursday, November 6, to accommodate more people's schedules. You can attend from 10:00–11:00 a.m. or 5:00–6:00 p.m., U.S. Pacific time. The registration forms have a handy little pull-down list that shows what times those are in pretty much any time zone. Digitize and Share Those Newspapers! Tonight on Antiques Roadshow I watched the first of three episodes from Jacksonville, Florida. One of the items appraised was a bound collection of original copies of a newspaper running from 1861–1865. The Family Friend was published in Monticello, Florida. The appraiser, Ken Gloss, explained that this is a particularly rare find because it was a Confederate newspaper. As the war went on the Confederacy ran out of supplies for everything and publishing a newspaper probably was not a high priority, so it's pretty impressive that this one had issues in 1865. There were even two copies of the issue reporting on Abraham Lincoln's assassination, though it appeared almost two weeks after the fact, because news traveled slowly in those days. The Family Friend appears in the newspaper directory that is part of the Library of Congress Chronicling America Web site. While the site is known primarily for its collection of online digitized newspapers, it also includes the directory, a listing of newspapers that were published in the United States, not only those that have been digitized. The only known issues listed in the directory are from February 22, 1859 to December 24, 1861 at the University of Florida in Gainesville and one issue, January 16, 1864, at the American Antiquarian Society in Worcester, Massachusetts. 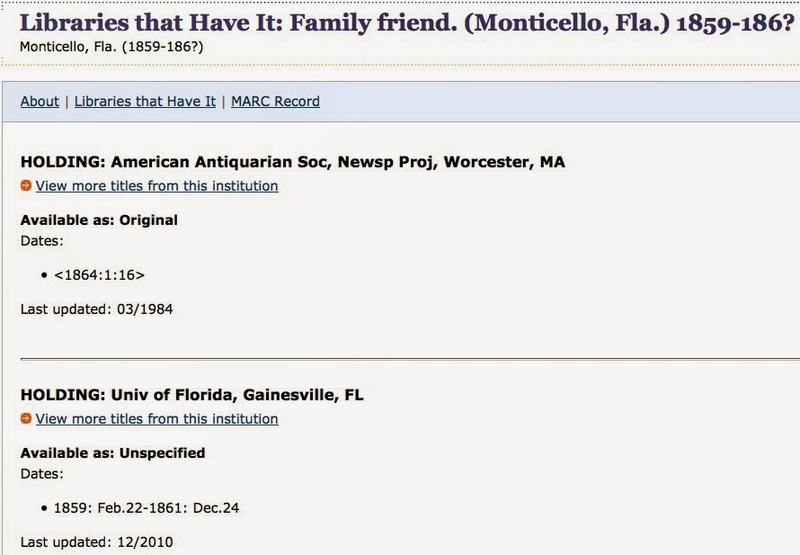 The Florida Digital Newspaper Library at the University of Florida has 140 issues of The Family Friend digitized, apparently the issues listed in the Chronicling America directory. The copies the guest on Antiques Roadshow owns may be the only ones still in existence for the later dates. I checked the lists of newspapers on NewspaperArchive.com, GenealogyBank.com, and Newspapers.com, and it does not appear on any of them. So my question is, who knows this man, and how do we convince him that the newspapers need to go somewhere where everyone can read them — such as being digitized and placed online? Assuming that he still has the book, of course. I hope he didn't simply place them in an auction to be sold to the highest bidder, then to be hidden away in someone's personal library. I know the filming was done during the summer of 2013, so he's had a year — what has happened with those newspapers? So CNN decided to jump into the genealogy program pond also. It began a theme week of programs featuring family history journeys, Roots: Our Journeys Home, on October 12 with Anthony Bourdain's Parts Unknown. The idea is that hosts of several of their regular programs will take some kind of genealogical journey and learn about their roots. Instead of creating a stand-alone program, the family history apparently will be integrated into the existing programs. If the genealogical search in Parts Unknown is comparable to what will happen in the other programs, I'd say there's not much worth watching. The promo material from the CNN Web site said that we would see an "investigation into the puzzling history of the Bourdain’s great, great, great, grandfather, Paraguayan émigré Jean Bourdain" (let's ignore the poor editing, shall we?). Unfortunately, the amount of time devoted to Bourdain's family history was less than ten minutes (and possibly as low as five minutes) of the one-hour episode. 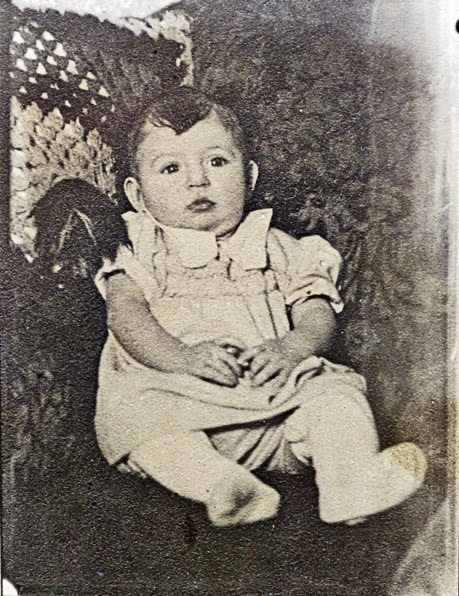 Bourdain already knew that his great-great-great-grandfather, Jean Bourdain, had immigrated to South America from France sometime during the 1850's and had disappeared by the 1880's. Jean went to Argentina first and then to Paraguay, and after that the family didn't know what had happened to him or when or how he died. Bourdain said he really wanted to know how his third-great-grandfather had died and where he was buried. We learned quite a bit about the history and food of Paraguay, which is what the program normally is about anyway. (Because I'm a language geek, one of the most interesting factoids for me was that Paraguay is the only country in South America to have an indigenous language as an official language.) But what did we learn about Jean Bourdain? The researchers were able to determine in which cemetery Jean was interred but could not find his grave. Bourdain walked around the Recoleta Cemetery in Asunctión, found nothing, and looked disappointed. The researcher told Bourdain that it was likely that something else had been built over whatever grave Jean Bourdain had. And that was it. Not a very impressive beginning, in my opinion. And I'm left wondering why the family didn't know when Jean the elder had died, since Jean the younger didn't leave the area until two years later. I'll still try to watch some of the programs scheduled for later in the week. I am pretty sure I'll miss every episode of New Day; 6:00 a.m. makes it way too early for me, whether it's Eastern or Pacific Time. It's a shame, because Chris Cuomo's story sounds interesting, and I'm wondering if the Spinozas from whom John Berman descended were Sephardic Jews. But I've already put the programs that air later in the day on my schedule. I am particularly looking forward to the journeys of Wolf Blitzer and Sanjay Gupta. And maybe I can catch the others later On Demand. The new season of Finding Your Roots has started, but I'm running a week behind on viewing, because PBS is airing the program against NCIS. I'm sorry, but I've found it easier to watch Finding Your Roots at alternative times than to wait for NCIS to appear in my On Demand menu. So maybe I'm not totally obsessed by genealogy after all. As anyone knows who has watched both programs, the premises behind Finding Your Roots and Who Do You Think You Are? are very different. A WDYTYA celebrity starts out by talking about a specific question he wants to know the answer to or wondering if something in her family background has any relationship to what she is like. The program sends its celebrities around the country and sometimes the world in search of documents, even though they are not doing the research themselves. We watch the process of discovery and follow one clue to another (though as I often comment, the path shown may have huge leaps and departures from logic). The question voiced at the beginning is handled by the end of the episode. In Finding Your Roots, on the other hand, we do not see any of the research. Each episode has a theme of some sort and three to four celebrities whose stories tie into that theme. It would appear that the theme and a predetermined narrative are chosen, and the producers then look for celebrities whose storeis fit, though it's possible they have a pool of celebrities they research and then put together themes and narratives based on what they find. Our host, Henry Louis Gates, Jr., presents each celebrity with a completed book, and during the episode a few items are highlighted and sometimes discussed. We are completely removed from the research process and rarely have knowledge of how information was discovered or how one piece connects to another. We're very much on the outside looking in. From my perspective as a genealogist, there's little to comment on, because it is impossible to follow the flow of research. All that's left is an entertainment piece and possibly finding out about a new research resource, such as the episode featuring Sanjay Gupta, in which I learned about the existence of some written family records for Indians prior to Partition. So far I have seen only the first episode of the new season, "In Search of Our Fathers", featuring Stephen King, Gloria Reuben, and Courtney Vance. For differing reasons, each of the celebrity guests grew up not knowing their fathers. As expected, various discoveries were made about their fathers, and they came away knowing more than they had. But some things puzzled me. For example, Gloria Reuben said that she had not been able to learn the names of her father's parents from her mother. The way the story was presented, it appeared that Reuben's parents had married in Canada. Canada's marriage licenses require both parties to list their parents' names. So why was the information not available from that resource? Did they not marry in Canada? Did they marry at all? Then I thought that several parts were phrased poorly. When discussing King's father's decision to change his name from Pollock, Gates acted surprised that the researchers were not able to find out why he changed it. What's the big surprise? It's rare to find documentation of a name change in the early 20th century for anyone. When Gates talked about the influenza pandemic, he said it "wreaked havoc across the country." That's quite an understatement, considering that part of the pandemic's infamy comes from the fact that it was worldwide. And when speaking of Vance's father, in the beginning Gates said he was a foster child, then later used the word adopted without any explanation for the change in terminology. The foster care system and adoption are very different legally and emotionally for the people involved; the terms are not interchangeable. On a personal level, I don't like hopping back and forth between each celebrity's story. I find that technique merely emphasizes the lack of continuity that is inherent in not following the research process. I find Gates' habit of reading directly from his notes to be somewhat stilted. I also don't like Gates' heavy reliance on DNA and how much credibility he gives autosomal results. Judy Russell, the Legal Genealogist, has explained very clearly that these numbers are essentially "cocktail party conversation" and nothing more. On the other hand, something I really enjoy about Finding Your Roots is that since it's on PBS, I don't have to suffer through an Ancestry ad during every commercial break; they're limited to one appearance in each of the beginning and ending underwriter sequences.